Yeah! I'm so glad to be back. I enjoyed myself for a couple days, but after that I was just ready to come home! I feel like Dorthy - "There's no place like home!" 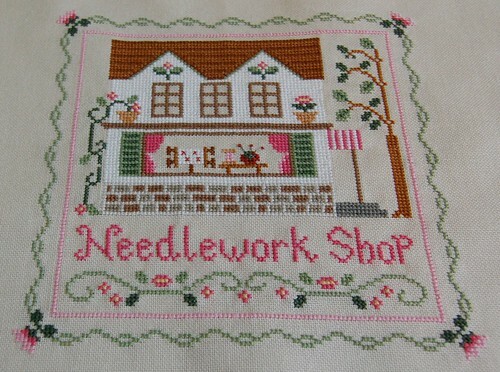 Anyway, I ironed my "Needlework Shop" (sorry Wendy, I just had to do it!). And here it is next to my "Tea Room"
The Tea Room and the Needlework Shop look really good together! What are you planning to do with them? Hang them on the wall? Great work ... they both look really good together. Can't wait to see all of your sweet treats. So cute and great they both are! Wich will be next? They look great as a pair Nicole - congratulations! They look magnificent together, great job! I had to add Sail Away to my stash as well...hopefully to be stitched up sooner rather than later. Looks great! Hope you had a nice time away. Your Needlework Shop is awesome. I love the pair of them together. You should have Sweet Treats finished in no time. Great job! They do look lovely together - very nice pair. I know what you mean about being home - I love going away, but it's so nice to come home! Hi there! I have looked at a lot of your pics and need to know.... HOW do you get your stitches to lay perfectly flat??? LOL You do beautiful work and I am enjoying your blog! Everything looks so pretty together! The Needleshop is lovely!! It looks great with the Tea Room. I love the soft colours of Sweet Treats - Cake. You'll have this completed in no time. What a gorgeous design ST is. Nice to come home to a little stash. I join Erica in her question, but specifically, are you a needle poker or a needle sew-er? Your projects are all so lovely, and the colors are so yummy. I'm especially anxious to see you start Sail Away, which I almost bought the other day and didn't. Probably seeing yours will convince me I made a mistake. It's okay, Nicole, you are forgiven. *wink* The finish looks gorgeous! I agree.. what are you going to do with the two of them together? They are great complements. Glad you made it back home safely! Both Needlework Shop and The Tea Room look great. I think you made the right decision to restart NS on the same fabric! Sweet Treats has some really gorgeous colours. Wonderful. They look great together. I am charmed with your blog, and all your works. Wonderful finishes...they look great together! Now I'm drooling. Both designs look great together. I've just started stitching Sweet Threats. It's a fun design. Look forward to your finish piece. Ohhh, congratulations on your beautiful finish! 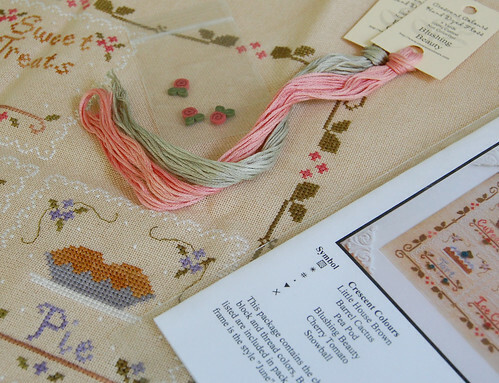 I love the shoot of The Needlework Shop and the Tea Room! By the way, I love my home, too! Yes, "There is no place like a home!"